The cross country phase started at 9am and the temperature was already high by then - although by the end of the competition it was touching 40 degrees! The course started in the flat field outside the main Arezzo complex and twisted and turned around before heading along the stream and into the main arena where they jumped the last 6 fences. Libby Seed & Mr Vick were the Team GB pathfinders and they did an excellent job arriving at the finish with perfect timing, crossing the line 5 seconds under the optimum time. The remaining GB riders followed her example perfectly and all of the also finished inside the time, a very impressive result. However, the best 3 riders from both France and Ireland, who had been in Gold & Silver place after the dressage also went clear within the time, as did the best 3 Irish riders and so the leader board remained unchanged. Fifth placed Germany, however, had two of their team riders eliminated and so dropped to last place. The highest scoring Danish rider after the dressage was also eliminated, so they dropped from 6th to 7th. Although the positions of the top teams did not change, the gaps between them are small so the jumping phase could be very influential. Indeed, Italy are only 1.7 penalties behind the leaders, France, with GB 4.5 behind Italy and Ireland just 0.5 penalties behind GB! With a fence down in the jumping adding 4 penalties, clear rounds will be required to win a medal. Individually, Yasmin Ingham & Craig Mor Tom are still in 3rd place, with Pumbaa Goess-Saurau & Killacoran Blue in 9th, Rose Nesbitt with Carrowmore Gemstone in 10th, Libby & Mr Vick in 11th, Chelsea Pearce & Catherston Nutsafe in 12th and Charlotte Bacon & Three Wells Breeze are 16th. The next hurdle is the final vet check is at 8am tomorrow, followed by the jumping at 10.30 in the main arena. The second and final part of riders performed their Individual Tests today to decide the first set of Individual Dressage medals. GB's Rose Hugh-Smith & Holsteins Derwisch were the first to go. Phoebe Peters & SL Lucci were drawn just 4 ponies later and they produced an even more impressive test that received marks ranging from 79.756% 76.707% 81.098% 78.537% 79.146% and an overall average of a phenomenal 79.049%. However, the class still had another three and a half hours to go and other potentially high scoring combinations like Lisanne Zoutendijk (NED) & Champ of Class and Semmieke Rothenberger & Deinhard B , who scored below expected in the team test as he was very unsettled to start with. When first Lisanne and then Semmieke scored below Phoebe and there were just 4 riders left, the unthinkable started to be believable and not only was GB going to get it's first individual dressage medal - but it was going to be GOLD!! 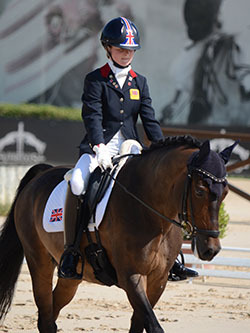 Phoebe's talent and dedication (and the support of her family) are all amazing and it's hugely to Phoebe's credit that she has improved with Lucci from an average of 71.781% and 10th place in 2012 to being the 2013 Dressage Individual Champion. Then it's the Kur tomorrow, all start level and there is all to play for again! 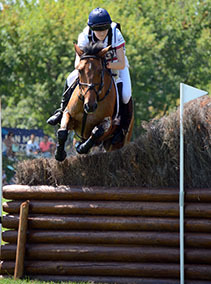 Overall, the other British riders in the class of 55 competitors placed 11th (Erin Williams & Dynasty), 22nd (Rose Hugh-Smith & Holsteins Derwisch) and 23rd (Rebecca Bell & Valido's Sunshine). The top 15 combinations in the Individual competition compete in Sunday's Kur (Freestyle to Music), but each country may only put forward their best 3 combinations. Erin & Dynasty and Phoebe & Lucci go through for GB. There was a Consolation Jumping competition for those riders that had not got through to the Individual final. As all the British riders are through to the Individual Final there were no Team GB representatives in this class.